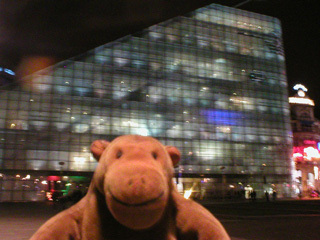 "Let's see what they've got in this exhibition"
Mr Monkey took the train into Manchester, did some shopping, and then waited outside Urbis until the doors opened. He stayed in the cafe while Mr Rik had a bottle of Duvel and there were some speeches. 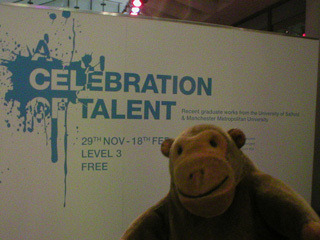 Then he set off to find some talent to celebrate. You can read about the exhibition at the Urbis website.